Bring the whole family to Fifth Third Field on Saturday, July 20, 2019 at 8:00am for the Dragons 5K! 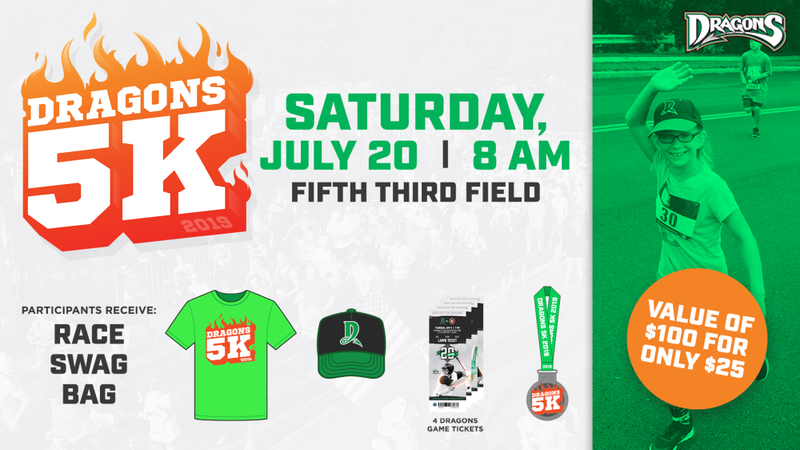 All participants receive FOUR (4) lawn tickets to a future Dragons game, custom Dragons 5K t-shirt, Dragons hat, NEW finisher's medal and entry to the post-race party inside Fifth Third Field. BONUS: Sign up within the first 30 days of registration being open (by March 2) and receive two (2) BONUS stadium seat tickets to a Dragons game in April or May! With $100 worth of swag included when signing up, it really is "THE RACE THAT PAYS YOU! Additional race information can be found at http://www.daytondragons.com/dragons5k.